Community-based palliative care has become the focus of palliative care’s growth and opportunity. Twelve of the largest randomized control trials on palliative care are community-based and result in equal or greater survival, positive satisfaction from patients and caregivers, and equal or less cost. Surprisingly, sometimes the business case is the easiest to make (Cassel et al. 2015). With health care financing that embraces value-based programs, such as serious-illness care models, shared savings, bundled payments, and global budget revenues, community-based palliative care shows great promise and may be part of the solution to provide better care for patients at an affordable cost. Some key obstacles include a shortage of practitioners and the necessity to perform as a public health system instead of a revenue-generating center. We provide examples of some successful programs that are reproducible. Gomes B, Calanzani N, Curiale V, McCrone P, Higginson IJ. Effectiveness and cost-effectiveness of home palliative care services for adults with advanced illness and their caregivers. Cochrane Database of Systematic Reviews. 2013b; Issue 6, pp 13–33. Art. No. : CD007760. https://doi.org/10.1002/14651858.CD007760.pub2. Jang RW, Krzyzanowska MK, Zimmermann C, Taback N, Alibhai SM. 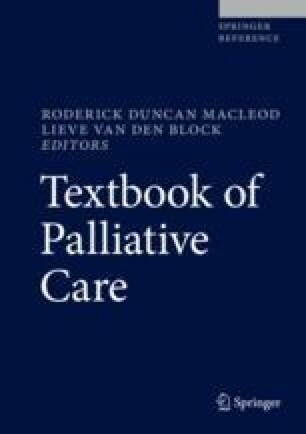 Palliative care and the aggressiveness of end-of-life care in patients with advanced pancreatic cancer. J Natl Cancer Inst. 2015;107(3). https://doi.org/10.1093/jnci/dju424. Print 2015 Mar. pii: dju424. Kerr K, Cassel JB, Rabow MW, et al., for California Health Care Foundation. Uneven terrain: mapping palliative care need and supply in California. 2015. www.chcf.org/publications/2015/02/palliative-care-data. Last accessed 30 Oct 2017. Temmy Latner Centre for Palliative Care. History of the Temmy Latner Centre for Palliative Care. In: Sinai Health System (ed) 2015. http://www.tlcpc.org/tlcpc/history. Accessed May 30, 2018.